As world leaders meet in Switzerland for the Geneva-2 talks, an Arab League official has described the country's humanitarian situation as "dreadful" due to increased difficulties in providing aid, underscoring the continued ineffectiveness of the ongoing peace talks, which have yet to yield any tangible results towards putting an end to the war that has claimed over 100,000 lives in three years. In an interview with Ahram Online, Dr. Faeqa Saeed Al-Saleh, Assistant Secretary-General of the League of Arab States, said that areas under siege in the conflict-torn country have become inaccessible for aid groups, but that the Arab League and the UN must work together to overcome the challenge. Al-Saleh said that any points agreed upon from the Geneva talks will require an action plan to make sure they are implemented. As talks in Geneva entered their sixth day Thursday, AFP reported that discussions were set to focus on terrorism. The delegation for the regime of Bashar Assad has long insisted that the talks need to address the jihadists and armed groups in the opposition, whom it blames for most of the country's bloodshed. Nevertheless, Al-Saleh said that negotiations were still taking place in Geneva in order to determine how to provide essential supplies within Syria. What makes it so difficult, he said, is the complete breakdown in security, especially in cities under siege. Recent AFP reports from Homs, Syria's third-largest city, have highlighted the impasse of delivering aid, with besieged residents waiting on UN trucks which must in turn wait for access before they can bring the food and medicine. 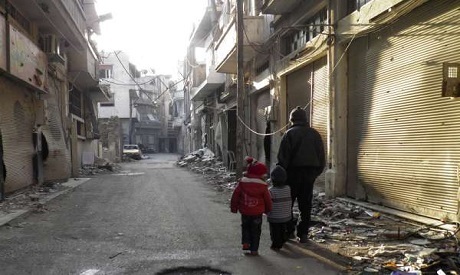 Assad's regime has promised to allow women and children safe passage from Hom's rebel-held areas, where an estimated 3,000 people are living with near-daily shelling and the barest of supplies. The opposition has demanded for aid to be allowed in. Meanwhile, UN and Red Cross groups remain on standby, waiting for approval to move in. The Yarmouk Refugee Camp, home to nearly 150,000 Palestinians living outside of Damascus, is another example of an area under siege. According to AFP reports, the camp is mainly controlled by rebel forces, but it has been bordered tightly by the army since last June, making it impossible for anything or anyone to get in or out. Al-Saleh said that it was very hard for the Arab League to enter the Yarmouk camp by itself to provide humanitarian aid without UN negotiations on its behalf, a situation which mirrors the rest of the country – even areas held by the opposition are still closed off to access. It was reported on Wednesday that 20,000 people are currently facing starvation in the camp. Al-Saleh said that children in the camp are being murdered and facing extreme hunger and violence. It's a crisis that "we all must overcome nowadays as humanitarians," he said.